I'm glad to announce that we are giving away a FREE copy of the much awaited eBook "Software Testing Complete Guide" to our readers. The regular price of this testing book is $19.99USD but for a limited period we are giving away this book absolutely FREE to "Software Testing Tricks" readers. This comprehensive book will help freshers and newbies in testing with how to get started in testing, understanding various testing concepts, QA methodologies, fundamentals and other day to day activities that a software tester must know when joining this field. How to Download Software Testing Complete Guide eBook for FREE? You can do this by referring to the "» Download FREE eBook" section on the right side-bar of the site. 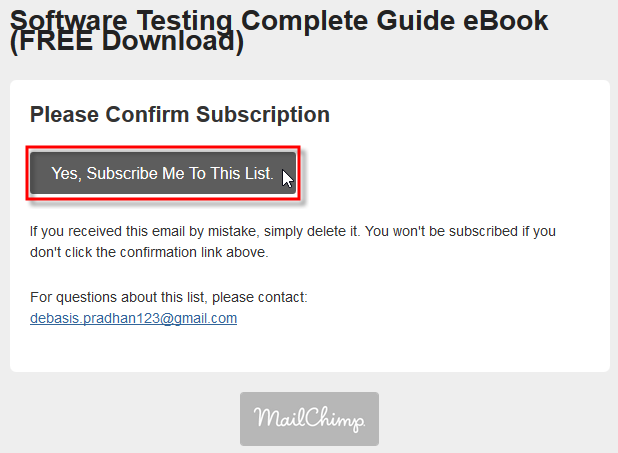 Once you enter your email ID and click on Download button, you'll receive an email that looks something like as shown below. It is important that you click the "Yes, Subscribe Me To This List." 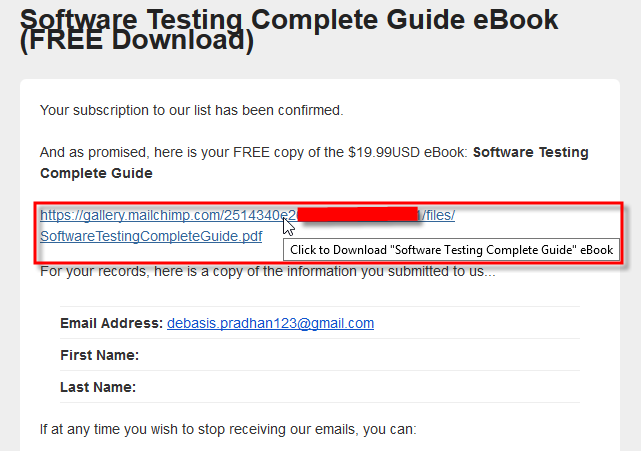 button to be able to grab your FREE Software Testing eBook. As soon as you click the "Yes, Subscribe Me To This List." button in the above email, the FREE eBook link will be emailed to you. That's it! You can click on the download link to get this $19.99USD worth eBook totally free. So what are you waiting for? Go ahead and grab a free copy of this eBook as long as it is FREE. Currently we are giving away a limited number of copies to our readers and this offer may end soon. So HURRY! And don't forget to let me know how you felt about this eBook. There are more such interesting testing books that I'm writing right now and your feedback is important to me. Thank you for sharing an incredible one. Very helpful book for me, because i am newbie in Software testing and this ebook helps me lot.